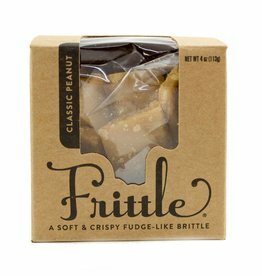 Frittle combines the classic peanut-buttery sweetness of brittle crossed with peanut fudge. The result is a soft, crispy fudge-like brittle with just a hint of salt. Nine month shelf life. Original: Peanut butter (roasted peanuts, sugar, 2% or less of molasses, fully hydrogenated oils (rapeseed, cottonseed, and soybean), salt). Sugar. Corn syrup. Cream of tartar. Salt. Manufactured in a facility that also processes peanuts, tree nuts, dairy, eggs, soy, and wheat.